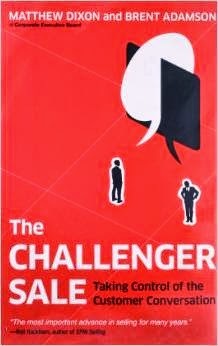 I see The Challenger Sale on a lot of office book shelves these days. If you're not familiar, the Challenger Sale is the next step in the evolution from transactional sales to solution selling and now beyond. Setting out to try and identify what "star" performers are doing differently—with the goal of training the middle 60% to be better—the authors undertook a large scale study of thousands of sales people, looking at 40+ dimensions. Doing factor analysis, they found that reps, across industries, clustered into five groups. Four of the groups, the Hard Worker, the Relationship Builder, the Lone Wolf, the Reactive Problem Solver are likely recognizable to anyone who works with sales people. The fifth was the one they dubbed the Challenger. And it was this group that consistently performed better. Each group brings a number of good qualities to the table. What the Challengers bring is a, well, challenging approach. They do what the authors call Teach, Tailor and Take Control. They teach prospects, tailor a solution, then take control of the relationship. I'll leave it to you to read the book and explore the details. What motivated me to post this was what became clear as soon as I saw the "Teach, Tailor, Take control" framework for selling. That is, Challenger sales reps succeed because they do exactly what marketing is supposed to do. When its done right, Teach, Tailor, Take control is marketing. We educate, frame the solution, and nurture the prospect along their buying cycle. In other words the best selling approach is not selling, it's marketing. Whatever the benefits of bringing a Challenger framework to your organization's sales team are, one of the biggest opportunities is to help align sales and marketing.